I was in the NORTH. Up at the coasts of Cagayan and the Ilocos Norte provinces when I was again invited to be part of Lakbay Norte’s 2011 edition, Leg 2, visiting several new and interesting spots as well as reacquainted with some old sites. The Ilocos Norte Sand Dunes is a national geological monument that covers a wide expanse of the western part of Ilocos Norte from Pasuquin in the north to Currimao in the south. 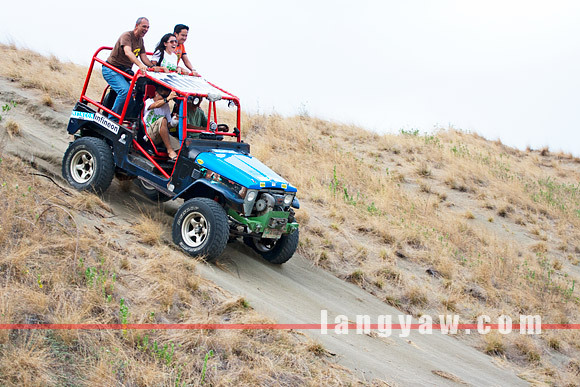 In La Paz, Laoag City, the sand dunes there is a good alternative to the one in Paoay, which we visited a year before for sand boarding and 4×4 wild adventure. While sandboarding is fun, just look at their faces here, it somehow is limited to a small area of the expansive La Paz Sand Dunes. To really enjoy the wide and beautiful scenery that stretches for several kilometers, a ride on a 4×4 vehicle is recommended. Riders not only get to cover a lot of ground but there are steep inclines and drops that gives that addictive adrenaline rush as you scream your hearts out! From my observation, the La Paz area has more vegetation than the one in Paoay which is much drier but I could be wrong as the weather might just have been different the first time I went there the previous year prior to this one. If you are visiting the place, it’s better to get in touch with the Paoay Off Roaders and Adventure Group (Benny Arce, +63 917 5230331, [email protected]). LEAD (Reny Tan, +63 919 8735516, www.wentravelandtours.tripod.com) also offers this one.